In 2006 we installed three enormous specimens of the lovely Philippine orchid, Vanda luzonica in the Orchid Display House, two like bookends atop the cedar pergola and one on a cork tree. The effect was instant jungle. You could practically hear the sinuous roots hissing as they coiled through the cascade of stems. What a terrifically theatrical plant to add to a tropical garden! Luxuriance is not to everyone's taste. 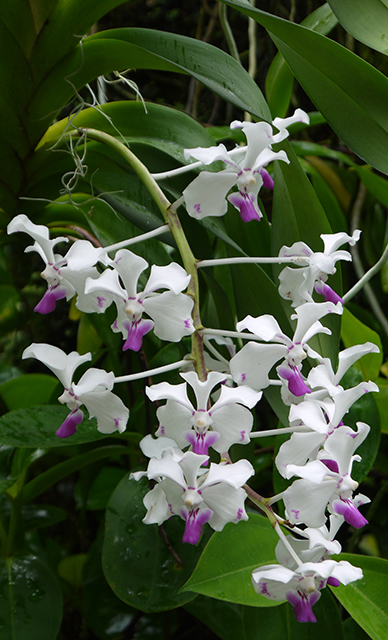 Alex Hawkes, the distinguished American horticulturist, in his classic Encyclopedia of Cultivated Orchids notes disapprovingly that Vanda luzonica is "often rather rank-growing." Not surprisingly, Vanda luzonica is strictly lowland tropical. It grows at 500 m. elevation in wet forests on the island of Luzon. Pour on the heat, moisture and fertilizer, and it will one day overwhelm you. I love the pristine white petals. Vanda luzonica is flowering now in our Orchid Display House.